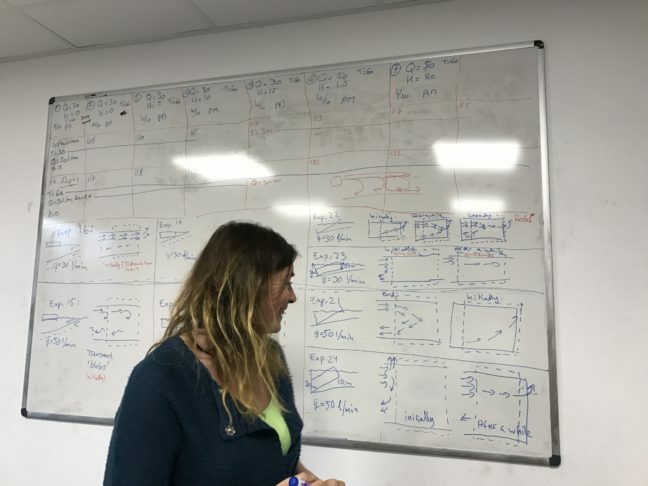 We are very deep into discussing all the different ice shelf experiments that have happened so far. As you see above, the white board in our office is filled with drawings of our interpretations of the experiments. And as you know, things don’t always go exactly as planned. Or, in fact, most of the time they don’t. One thing that has been happening in our experiments is that water flowed out of the channel underneath the ice shelf. Not a lot of water, but after long discussions, we decided that — since in reality there is no way for water to come out that end of the channel, because there is land closing off the channel at the end — even a little water was too much and that we needed a way to block off that end of the channel. 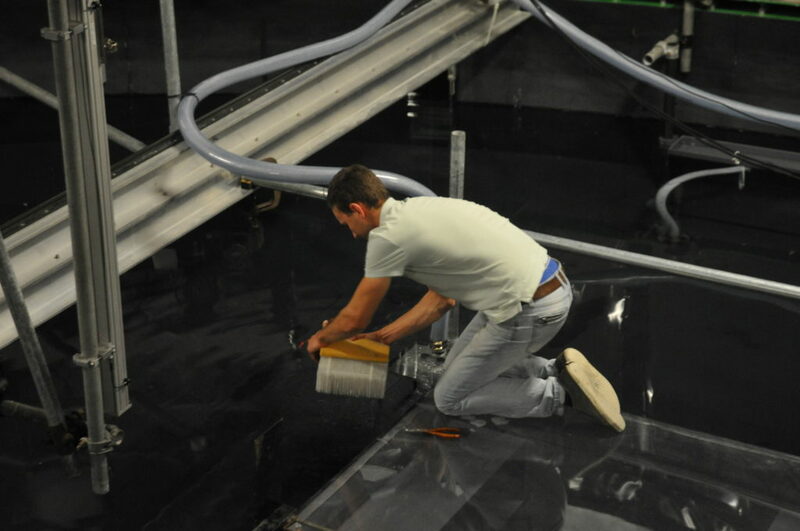 However, constructing anything inside a rotating tank full of water and with a lot of scaffolding just above the water level isn’t easy (as I found out when I was sweeping the tank, trying to duck under the scaffolding and flooded the waders I was wearing. Yep, true story…), so even after deciding that we needed a solution, it still took a lot more discussing until we actually had a solution that everybody was happy with. 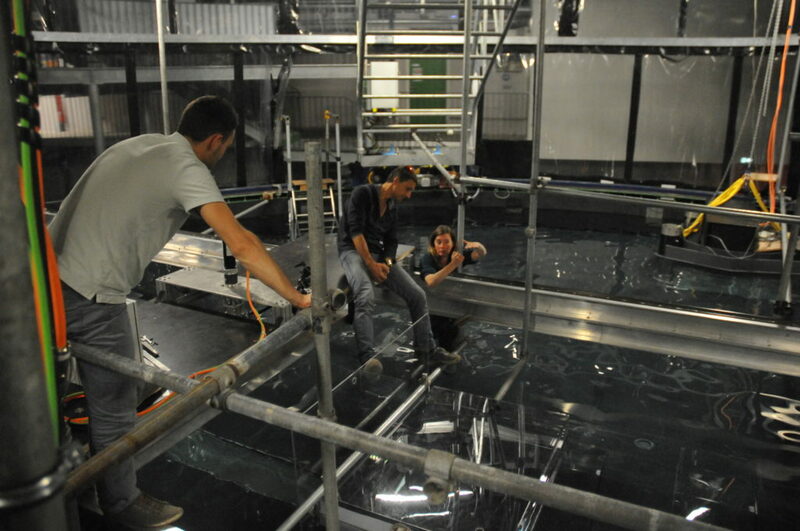 Actually, the wall is in the tank already, so now we’ll start investigating whether it actually has an effect or not! What happens when you accidentally change the rotation rate of the tank just a liiiittle bit? Inertial oscillations! At some point the angular velocity of our tank was accidentally changed a tiny little bit. That was almost instantly corrected, however we could see the effect for quite some time later: inertial oscillations! All the water in the tank moved in circular motions at half the period of rotation. You read about inertial oscillations in oceanography all the time, but it was really cool to actually observe them! I have previously written about how we thought we were going to get our source bubble-free (link here). Turns out, it’s not quite as easy as we thought — there were still plenty of bubbles everywhere! But luckily, Thomas came to our rescue and put some foam inside the source so the water has to pass through there before leaving the source through the honeycomb. That effectively gets rid of all the bubbles since they just don’t fit through and surface inside the source box instead of outside of it in our experiment. We were really concerned about all those bubbles for two reasons: A) They might show up in the pictures we want to analyse and destroy any correlations we are hoping to find since they are there one second and then burst and disappear the next. And B) since the bubbles left the source below water level, they popped up to the surface and introduced vertical flow where we really didn’t want it. But anyway, the bubbles are gone now! It’s amazing how well that works and all our (ok, my) prophecies of doom (the water is never to go through the foam! It is going over it and then enter the tank as a water fall! And even if it does go through, the particles we need to visualize the flow with, won’t!) were completely unnecessary. Second: The unwanted water jet pump. 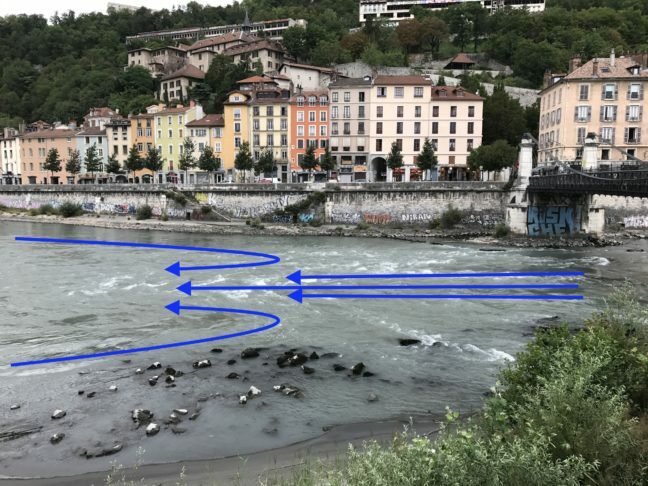 Below you see an example of the Isère here in Grenoble, where a rather fast flow is causing a return flow as soon as the river bed widens a little. On our first day at the Coriolis platform in Grenoble, I took a picture of the “source” in our experiments (see above): The plastic box that is fed by a hose from above and that has one open side with a “honeycomb” (or: a make-the-outflowing-water-nice-and-laminar thingy, technical term) that introduces the water into the tank that we want to follow around Antarctica. This source is sitting against our topography, and will be partly submerged so that we introduce the jet at water level and below (instead of having a waterfall going in). 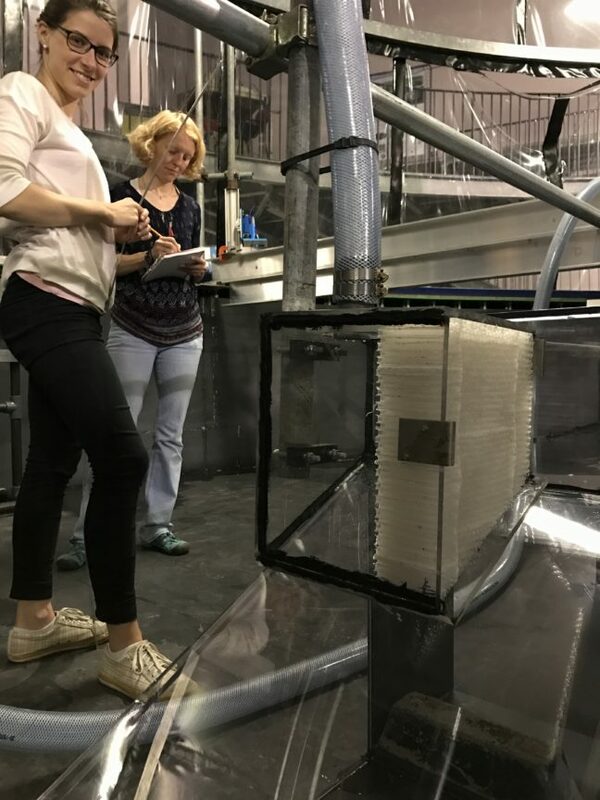 The idea is to get a nice and bubble-free flow because — as we talked about yesterday — bubbles reflect the laser very strongly and disguise the signal that we are actually interested in. 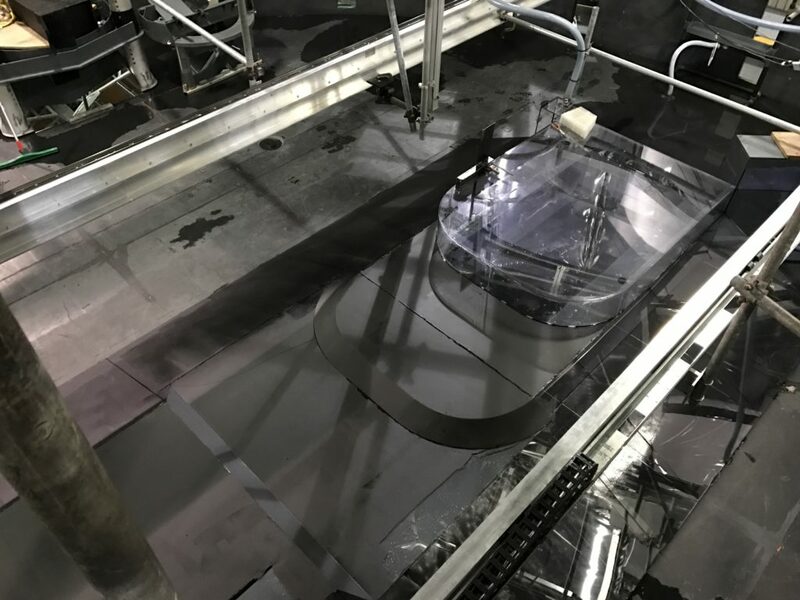 The inflowing water was free-falling through air before hitting the water inside the source box, thus entraining a lot of air bubbles directly inside of the source. Good luck flushing them out… The solution was to add an extra piece of hose to just below the water surface so no air can be entrained. So when we arrived at the lab this morning to an empty tank* we were delighted to see that the amazing Samuel and Thomas had already fixed the source! *Yes, the tank really was empty again. 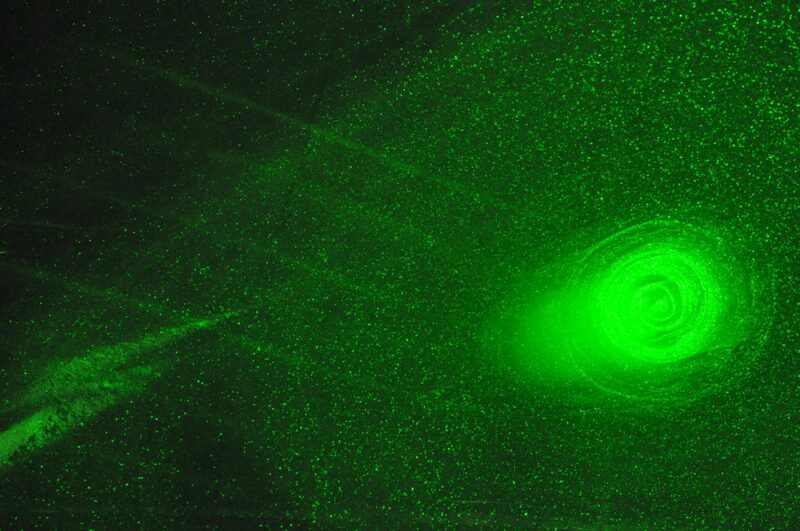 Turns out that the reflection of the laser off the topography is so strong that it’s both a problem for data quality and that too much of the light gets scattered out of the water to be safe when we use the laser at it’s real setting for the experiments rather than at the super low setting we used for the tests… Disappointing, yes, but we were so surprised and pleased when we arrived this morning and the topography had already been painted AND the source been fixed! 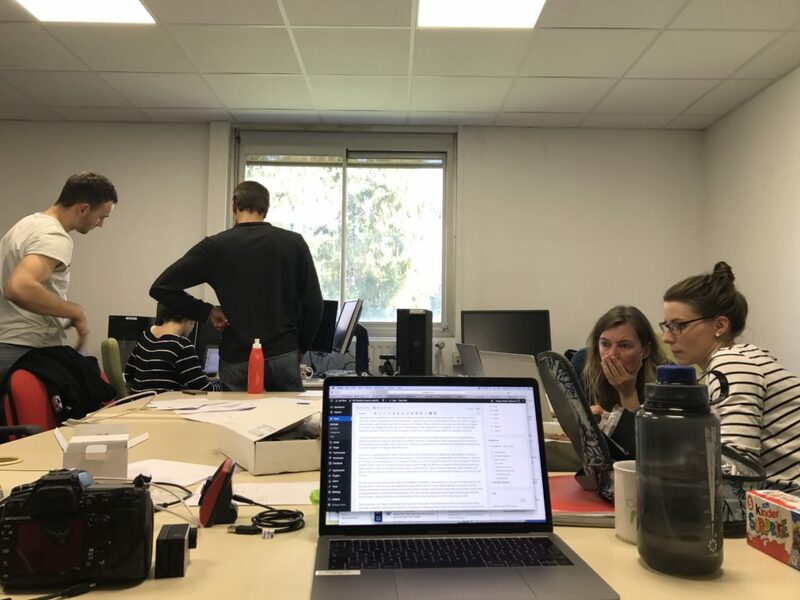 We are super impressed with and grateful to the awesome team here in Grenoble! 🙂 And we are happy to report that there is water in the tank again and we can start measuring after lunch!